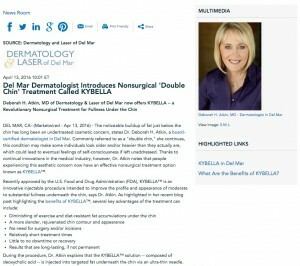 Deborah H. Atkin, MD of Dermatology & Laser of Del Mar now offers KYBELLA™ – a revolutionary nonsurgical treatment for fullness under the chin. 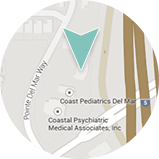 Del Mar, CA — The noticeable buildup of fat just below the chin has long been an undertreated cosmetic concern, states Dr. Deborah H. Atkin, a board-certified dermatologist in Del Mar. Commonly referred to as a “double chin,” she continues, this condition may make some individuals look older and/or heavier than they actually are, which could lead to eventual feelings of self-consciousness if left unaddressed. Thanks to continual innovations in the medical industry, however, Dr. Atkin notes that people experiencing this aesthetic concern now have an effective nonsurgical treatment option known as KYBELLA™. During the procedure, Dr. Atkin explains that the KYBELLA™ solution – composed of deoxycholic acid – is injected into targeted fat underneath the chin via an ultra-thin needle. Once administered, the formula works to gradually destroy fat cells, inhibiting their ability to store and/or amass fat. Depending on the patient’s unique needs, the entire treatment can generally be completed in approximately 15 to 20 minutes, she notes, and a topical anesthetic can often be applied to help eliminate any potential discomfort. While some swelling and bruising is common following the KYBELLA™ procedure, she adds, the majority of individuals are able to return to their normal daily routines within a day, if not immediately after treatment. Regarding results, Dr. Atkin states that initial effects of KYBELLA™ typically become apparent after about two to four treatments, though a total of approximately six sessions may be necessary to achieve optimal outcomes. Once the patient’s desired appearance is successfully attained, she says retreatment is typically not necessary as the results are long-lasting – and many times permanent – for most individuals. After obtaining her medical with honors from the University of California, Los Angeles, Dr. Atkin went on to complete her Internal Medicine internship at Scripps Clinic and Research Foundation, followed by her Dermatology residency at the University of Arizona. Certified by the American Board of Dermatology, she offers an expansive range of skin care treatments and laser procedures, including cosmetic injectables, IPL therapy, microdermabrasion, and more. In addition, she also provides CoolSculpting®, UltraShape®, and various other nonsurgical body contouring options. Dr. Atkin is available for interview upon request. For more information, visit dermdelmar.com and facebook.com/dermdelmar.